I just rewatched a bunch of what are generally considered the best films of 1957, and while this still is not my favorite film of the year and might not even be among my five favorite Kurosawas, I think it’s absolutely worthy of its lofty spot on the list. Akira Kurosawa’s adaptation of Macbeth to ancient Japan is even darker than Sweet Smell of Success, with a vision of humanity as unchanging, trapped in a cycle of murderous ambition and venality entirely of its own making. I especially picked up this time on the interaction between prophesy and free will: everything Washizu does is his own choice, but would he have made those choices absent the prophesy? His troops turn on him at the end, but only because he’s told them about the prophesy and they’ve seen the forest moving, if he hadn’t told them, would they have fought back against the siege? It’s telling that it’s Washizu’s act of mercy (letting the prince and Takashi Shimura go) that leads to his downfall: if he’d chased after and killed them, they wouldn’t have led an army that knew how to get through the forest to attack the castle. It’s this kind of thing that marks Throne of Blood as the most tightly constructed of the top movies of its year. There’s none of the haphazard sloppiness of Wild Strawberries, or facile caricatures of 12 Angry Men or Paths of Glory. Every piece of Throne of Blood fits together perfectly. Almost a little too well. There’s an airlessness to the film that is totally appropriate thematically (trapped as its characters are in an endlessly recurring loop) but that makes it a bit harder to love than some of the other films from this year (Funny Face for example, though I can see why someone might prefer Wild Strawberries for this reason, though, like I said, that film didn’t work for me at all). The standout actors are Toshiro Mifune and Isuzu Yamada, and they’re a perfect contrast in style: Mifune is constantly in motion, constantly retreating and bugging his eyes out. It’s one of his most intense performances, he starts at an incredibly high level and stays there for the course of the film, never going over the line into camp or mere bluster. Yamada’s Asaji, on the other hand, is all terrifying stillness. Hers is the most Noh-influenced of the performances, apparently. Donald Richie points out that it’s the two female characters (Asaji and the forest spirit) that are the most Noh-like, which is interesting if you read the story as more than the tragedy of a hen-pecked husband: it’s not just women that cause Washizu’s downfall, it’s the past itself, embodied in the ancient formalities and drives embedded deep within human nature. Wild Strawberries is the best! My review of Throne of Blood is just about to come out too. Good points. I only want to pose the possibility that, being westerners and dependent on subtitles, it is much easier to find fault in films that are part of your own culture and in your native tongue. Foreign films retain a distance and mystery that can be entrancing and disarming of the critical judgement of non-natives and I wonder what Japanese viewers would think of the same list of films. Of course, Wild Strawberries is foreign so my hypothesis only goes so far. Although with multiple viewings, WS does not stand up like ToB, I can find none of the “sloppiness” you cite. As far as tightness, Paths of Glory is pretty damn tight. But I love your ideas and wish I could buy you for a beer. Steve: looking forward to your thoughts. David: That's certainly possible. Though Throne of Blood being based on Macbeth would seem to mitigate the “exoticness” factor for this Western viewer, I'd think. Though that also raises the specter of the bias of Shakespearephila, of which I'm most definitely guilty. For a film that is in some significant ways about the horror of randomness, Paths of Glory is pretty tightly constructed. That's a fundamental difference in the worlds it and Throne of Blood create: Throne is relentlessly cause-and-effect. Unfortunately, my last viewing of Paths was pretty disappointing. Perhaps I'll go back to it in a few years and rediscover what I used to love about it. I think POG is worth a second look. In my case, it ended up being a 1000 looks since I spent 5 years making a documentary about it. Take a look at anatomyfilm.com if you want to get an idea about it. Have to say that whenever I've watch ToB, I never think once of Macbeth. 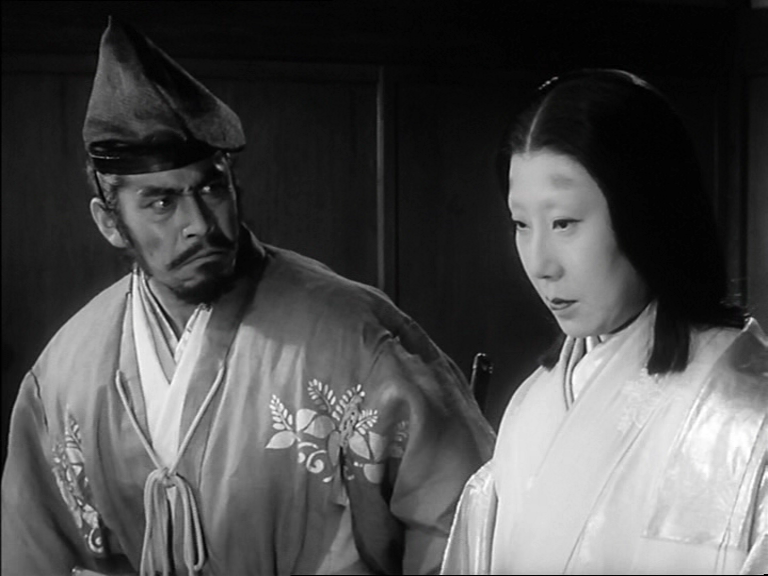 No film version of Macbeth has ever come close to Kurosawa's adaptation. I wonder how much of a film is made in the viewers head. If I could get a hold of a movie star, I would love to test the Kuleshov effect. Paths of Glory was always one of my favorite Kubricks. I've seen it a half dozen times or so. It was this last viewing a couple weeks ago that rattled me. Not in the filmmaking, which as always with Kubrick is of a very high quality, but more in its script. Looking forward to checking out your doc, though.